Hello everyone. First post. Recently purchased a new home and EVENTUALLY plan to build a dedicated theater and have 3 or 4 audio zones (maybe more) for music throughout the house. Would love some advise/ input on equipment. So far I have accumulated; rp280f, rp450c, rp250s (price matching @ bestbuy whenever frys or amazon went on sale). All speakers sit idle and have never been used. Was going to pull trigger on flagship avr but feel like it would be sad to invest thousands for a future paperweight. Also, given my "eventual" plans, I will need additional amplification anyway. So I thought a separate amp with a mediocre or used processor would be a decent start. Mcintosh caught my eye for thier looks and reputation, but am I crazy given the sensitivity of my speakers? I thought to start I would buy a newMc152 along with a used processors or avr then add from there. All comments & suggestions welcome and hope some has experience with pairing these speakers with mcintosh products. Peace & Love. Peace & Love. You got that right. You mean it isn't? Looking at the Meter scale you should still see them dancing plenty. The 98 dB at 2.83 V (1 Watt into 8 Ohms) at 1 Meter for the RP280f can be misleading. That would be its sensitivity at 1 Meter, but inside a room, you lose about 3 dB for every doubling of distance to the listener [not 6 dB; that's outside with no surfaces nearby, atop the proverbial flagpole, or in an anechoic chamber]. Each 3 dB loss requires doubling the power in watts to maintain the same volume. A common listening distance is 13 feet, or 4 Meters, 4 times the distance at which the sensitivity is measured. With the RP280f, for most Rock/Metal, some jazz and some pop, i.e. 90 dB to 100 dB, in a 3,000 cu. ft. room at 13 feet from the speakers, the center of the needle swing would probably be about where it is shown in the photo you posted. For soft passages in something that actually gets soft, like classical or jazz, the needles would probably be between 15 milliwatts and 0.15 watts -- or lower during very soft parts. But put on Fanfare for the Common Man, or Pictures at an Exibition, or the end of a symphony by Beethoven or Mahler (except Mahler's 9th), and you may see the needle peaking about 1/2 way between 15 and 150 watts, i.e., 80-ish or more! A lesser amp might go into clipping, threatening your speakers and sounding terrible. This may be why a number of people who say they don't like it loud, don't like it loud -- their amplifier or speakers are distorting. 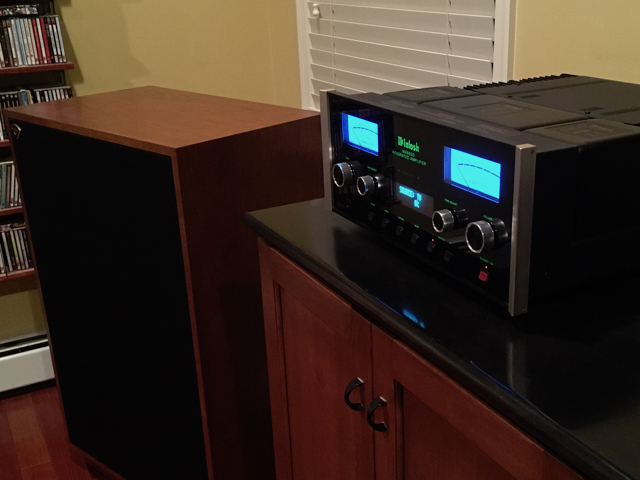 McIntosh and Klipsch are good choices for undistorted, wide dynamic range. Thank you for the reply! I found it both helpful & informative. Much appreciated. Anyone have thoughts on if makes more sense for me to purchase a new mc152 and add on from there, or buy a used mc205, mc207 or mc7205 online from a company like audioclassics in NY or mcintoshaudio out of TN? Pros for purchasing new: longevity. The specs off the mc152 seem like a nice match with my speakers. Also I like the idea of getting the latest and greatest. I can get a small discount on new & would cost less than the used products I'm considering. Pros ops for buying used: I can add more channels quicker. Would allow me to get a mcintosh model which would otherwise not be in my budget for sometime. It would be far from overpowered. As I type I'm listening to a pair of P37s hooked up to a MAC6700 (200 wpc) and the meters are swinging plenty and it's at a moderate Sunday morning level with Toto, Journey, etc. Bottom line is it's not as much power as you think. If you can get a deal on the 152s do it. You can always turn them in to 300 watt monoblocks down the road if you want. As you see in my signature I use a McIntosh MA6600 w/ Klipsch Cornwalls. From a "needs" point of view, ANY mac piece is overkill when paired w/ high-sensitivity speakers. ..My 200 w/ch. MA6600 rarely crests 4-5 watt peaks on my 102db efficient Cornwall III's and the music is loud enough to cause hearing damage. So you definitely don't need it. As for the wine-taster audiophiles who ascribe all sorts of sonic attributes to various brands, you'll have to wait for them to chime in. IMHO, all modern gear playing w/ in design limits sound pretty much the same. All that said, there are still other good reasons to buy a Mac piece. The stuff is beautifully built, will last years, is hand-made (for the most part) in a small upstate NY town, and their preamps and integrated amps almost always have tone, balance, and mode (mono/stereo) controls - something which I personally deem essential. When I bought my Mac I had far less efficient speakers, if I were to buy today I'd probably get the MA-5300 b/c 100 w/ch is still WAYYYYY more than you'd ever need and it's a good bit less expensive. I also like that it has a home-theater pass-through, something my MA-6600 doesn't have. I personally would not chose the MC152 b/c it does not have a Mode selector (mono/stereo) nor does it have home-theater pass-through which is really important if you want your 2-ch setup to share the front speakers of your home-theater. Edit: Oops, sorry, I thought you were considering the MA252, which is an integrated. Thanks for taking the time to reply and sharing your advise. Gives me something new to consider. Curious us if others think 100w would be enough for long term left and right channel purposes. Also, are the amps in the mc152 & ma5300 identical? I'm not sure I would want to compromise quality. I see that your speakers are a bit less efficient than mine so perhaps they will need a bit more power. Still, I can't image you'll ever need all of the 100 watts. ..But, as you said, let's see what others say. As for the amp section of the 5300 being identical to the mc152, I couldn't really say. Welcome to the forum. I am going to agree that McIntosh and Klipsch go great together. For many years I ran a two bridged MC2002’s on a pair of stock Chorus II’s that sounded great. Around 600 watts per channel into a 102db efficient speaker. The biggest change when I went from a single 2002 to the bridged pair has better mid-bass and the cymbal sustain / decay sounded better. I’m not sure how to describe this but when bridged the time to power, acceleration in car talk, was better or better dynamic response. So I am a big fan of power and with the above system it was hard to get passed 60 Watts continuous per channel in actual playing because the peaks were using the rest. So the amps did powergaurd on occasion. Disclaimer - listening at theses levels can cause hearing damage, it is important to limit exposure time. 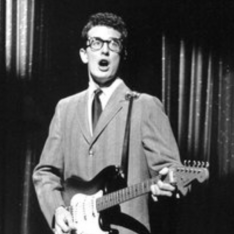 One of my friends described it like having The Who in your living room except no distortion, I was a little younger then. These amps now power Jubilees so I would also say you can grow with Mc’s as you may choose to update your speakers in a few years. Just my 2 cents. Super interesting. Thank you. Which one do I want? Lol. Should I assume that the mc152 is a more quality product? They are both quality products, that shouldn't even be a consideration. I really hesitated to answer, because I don't want you to take it the wrong way, and assume I am being rude. "Preferable" is a very subjective term. What is preferable to me, may not be to you or anyone else. You're asking a very general, open question that really has no exact/specific answer. You need to chose the product that will fit what YOU need it to do. 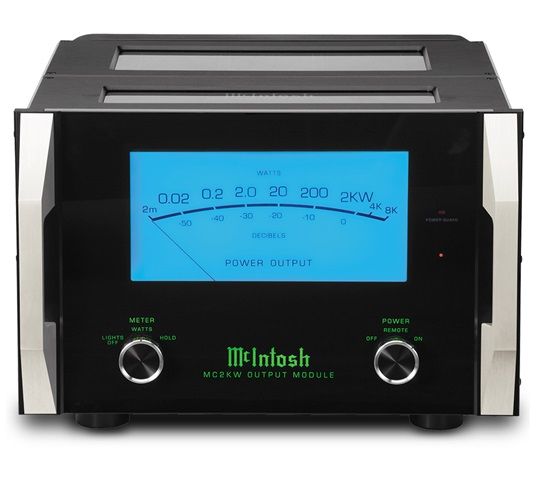 If you are wanting to purchase Mcintosh products, you need to decide what is best going to work for you in your situation. Mcintosh produces very high quality gear with a wide range of applications, both for 2 channel and multi-channel. Direct coupled are used in appropriate applications, and autoformers are used in other appropriate applications, and one or the other may not fit your needs. Now, for MY preferences, which you may not care about....I prefer the autoformer configuration, because IN MY OPINION, they sound just a bit smoother, and less forward than direct coupled.....But again, that is just me. I hope you find what you are looking for. also I think when buying new the amps with autoformers are on the higher end equipment. the amps with autoformers are on the higher end equipment. Yes sir, they are very expensive to produce.